Mathematics can be hard, but it can be fun and exciting too! On this page you will find activities in many areas of mathematics that provide students with opportunities to learn, and give them insights into how mathematics works. Students from pre-school through high school need to see the fun side of math and families can play a wonderful role in helping children enjoy doing math. The activities for download here are meant to give families an opportunity to enjoy mathematics together, and to help parents in their thinking about how mathematics is learned. Have a good time with MATH! Students need to see that the two subjects of art and math have a lot of wonderful connections, and that mathematics can help artists create art. This is a slide presentation of several optical art projects for kids from grades 3 through 8. The PDF file includes slide-by-slide animation of each art project that shows students how each is constructed. At the end of each project, there is an instruction page that can be printed as a handout for students or teachers. Counting is the most basic of all number skills and the most natural place for very young children to begin learning mathematics. This article is a primer on how parents might start their young children in the wonderful world of counting—and plant the seeds of enjoying math at a young age. Every day we are bombarded by information in the form of surveys and graphs. We must use our knowledge of mathematics and statistics to interpret the information buried in surveys and graphs to make informed decisions. This activity shows students the ins and outs of taking their own surveys and creating graphs from their data. The Weird Number is an animated movie telling the story of the “discovery” of fractions, or rational numbers, by a town of whole numbers who are natural numbers. Along with a great story there are half a dozen very interesting lessons in the basics of fractions–a good story that can teach about fractions! We take our simple base 10 number system for granted. However, its BIG numbers can help us understand our world, solar system, and universe, and at the same time its small numbers can help us understand the tiny worlds of cells, molecules, and atoms. This short film shows us both of those HUGE and MINIATURE universes while at the same time showing us the power of TEN! There is no more powerful use for computers than teaching a computer how to do something YOU want it to do. SCRATCH is a simple programming language designed for students of all ages where they can learn how to “teach” a computer how to do something while experimenting and having fun. Ten is a very important number in our number system. In the book, Ten for Dinner, a child invites ten friends to a party where the children have opportunities to play games, sing songs, eat food, and more! This set of activities provides children with several wonderful number activities to try. Measurement is an area of mathematics that is best learned by doing! Sneaker Math is a set of activities your children can do with some simple measurement tools and their own shoes. There is lots of math in those shoes! Polygons are shapes in geometry such as triangles, squares, and hexagons. This activity takes children through an exploration of many polygons, shows them how to make the polygons with rubber bands on a peg board, and encourages them to make their own Polygon Book about what they learn. 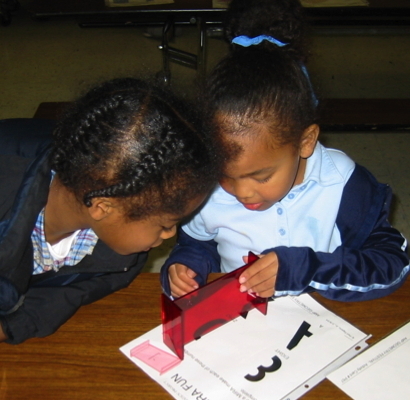 Understanding place value and base-ten concepts is critical for all young children’s ability to compute using addition, subtraction, multiplication, and division. Here are some simple games to help children explore these important place value ideas and have fun at the same time. The ideas behind probability are often counter-intuitive. The roll of dice doesn’t always result in what we think will happen. By playing simple probability games, such as Lucky Clover, children can get a better “sense” of probability. Math games are a great way to practice basic skills while at the same time learning advance mathematics concepts. SUM UP is a series of games that use probability and addition.